Immediately beyond Agia Anna. 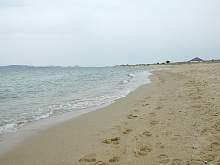 This is the biggest Naxos beach, stretching for around 4 kilometers (2 miles), and it is an ex-hippie paradise. There are a few hire outlets, tavernas and bars but it is not too built up as yet.